WOW Halloween Fun Escape 004 is the fourth episode of this point & click escape game series developed by WOWEscape. 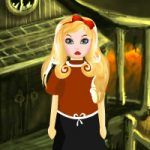 In this Halloween themed game, a cute girl came to a Halloween candy forest in search of a special treat. But unfortunately, she got trapped inside the woods. Your aim is now to help the girl escape from there by finding useful objects, hints and by solving puzzles. Click and interact with the items. Good luck and have fun! Stuck with 5 candies and don't know where they go?? clue for eyes right of scene with 3 bat candies in tree. it is down left of cupcake in next scene. POP missed a whole scene. out now. There is a sneaky stick next to the candy corn!! !